The Red Witch Empress Chorus has been around for a few years and has garnered quite a reputation for its distinct chorusing sounds and deep feature set of chorus and vibrato options. With whispers of this pedal’s amazing abilities becoming hard to ignore, I decided to seek an audience with the Empress herself to see if she lives up to her noble reputation and deserves the title and recognition as best guitar modulation pedal. While there are many options as far as quality analog chorus pedals go, none of them seem to offer as much tonal variation as the Empress Chorus. Red Witch have a reputation for packing in a lot of functionality into their guitar pedals as shown in many of their other offerings including the Synthotron, Violetta Delay, and Fuzz God II. The Empress Chorus is no exception. One of the most exciting features of this pedal is the Voice control which promises a range of unique chorus voicings that exceed any other analog chorus pedal around. Let’s run down the features of this intriguing pedal and discover her majesty’s secrets in our Red Witch Empress Chorus review. Mix control knob determines how much wet signal is mixed in with the dry. Depth control knob allows you to control the depth of the effected sound. Voicing control knob changes the delay time of the chorusing effect. Unheard of in a chorus pedal until now, this allows you to achieve any chorus voicing you could desire. Velocity control knob allows you to select the sweep of the sweep from stand-still slow to ring-moddishly fast. Vibe/Chorus flip-switch selects between Chorus and Vibrato modes. Bright Switch allows you to access more sparkle on the more shimmery settings. Stereo Operation available via lower left ¼” output jack. True Bypass footswitch for allowing your signal to pass unaffected when disengaged. 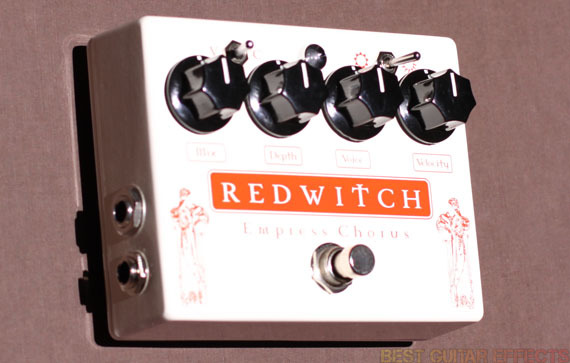 Visit Red Witch for more info about the Empress Chorus. I plugged in my American Stratocaster and dialed in a nice, pristinely clean amp setting. With the Empress Chorus in Chorus mode, I maxed out the Mix and Depth knobs, set the Voicing around noon, pulled the Velocity back to 9 o’clock, and engaged the pedal. The Empress Chorus produces some of the most clear and delicate chorusing sounds I’ve ever heard. Even at high Depth and Mix settings, having the Velocity set low produces a very non-invasive, subtle chorusing effect that makes whatever you play through it sound simply more beautiful than it would be otherwise. There’s an added dimension to the sound that doesn’t pull you into the effect that’s coloring the tone. No, it does something altogether different instead. The Empress Chorus seems to draw you into the sound of the music itself, adding an alluring magic to your sound that must be experienced firsthand to be fully understood and appreciated. Rolling up the velocity towards noon adds more noticeable movement. This gentle throb of the Empress draws more attention to the chorusing sound as it envelopes your playing, creating a swirling effect reminiscent of a Leslie-style rotating speaker. The Empress Chorus sounds absolutely lush on moderate Velocity settings, adding a fuller depth of character to your sound. At this point its worth considering how you want to set the Mix and Depth knobs. While many chorus pedals use only a depth control for setting the effect level, the Empress Chorus allows you to blend the chorus to taste with your unaffected dry signal via the Mix control. This works favorably with the Depth knob to give unparalleled control over how your preferred chorus sound is blended into your overall sound. The Voice control is another standout feature of the Empress Chorus that allows you to achieve an unprecedented array of chorusing sounds from this pedal. By controlling the delay time of the effect, the Voice knob allows you to achieve anything from a hollowed-out, filtered effect at the far left to deeply effected, mesmerizingly whooshy chorusing at the fully clockwise position. It’s worth listening to how the Voice setting affects the tone of the chorus. Thanks to Red Witch’s inclusion of this ingenious control function, the sound of this pedal is extremely intricate and varied. With lower Voice settings, the Bright switch can even be used for some added high-end sparkle if desired. It does raise the noise floor slightly when used with higher Voice settings, so it’s better used when the Voice knob is set somewhere below the noon position. I generally prefer to leave it off in most cases, but it does add some extra impact to the effected sound if you need your high-end to cut through a bit more. The Empress Chorus offers an incredibly wide range of chorusing sounds from its deceptively simple controls. Despite how easy this pedal is to use, you might find yourself getting lost in her sweet embrace, tweaking your ideal chorus tone to perfection. The Empress Chorus offers some of the most high-end analog chorusing sounds for those truly searching for the ultimate chorus sound. The Vibrato mode is worth mentioning as it turns the Empress Chorus into an entirely new pedal. Vibrato accents the affected voice, essentially detuning your whole sound in pure analog glory. Cranking the Velocity will deliver the expecting sea-sick vibrato wobble. I find the Vibrato mode surprisingly beautiful when you lower the Mix and Depth settings to added a subtly detuned pulse to your playing. The Vibrato mode is more than just a tacked on feature and deserves some exploration in its own right. The Empress Chorus indeed offers all that it claims and more; it’s definitely one of the best chorus pedals I’ve played. 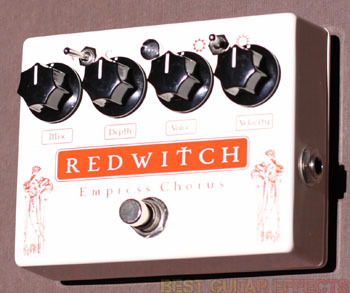 In characteristic Red Witch style, this pedal over delivers on all fronts. Let’s see the final result. The Empress Chorus certainly lives up to its lofty reputation. Red Witch have thrown down the gauntlet in creating not only one of the best chorus effects available, but one of the best guitar modulation pedals… period. The Empress Chorus is so good that you may find an immaculate tone within that defines your signature sound and never turn it off again. If you’re looking for a chorus of unrivaled depth, ease of use, and tone-shaping control, the Empress Chorus deserves your undivided attention. That concludes our Red Witch Empress Chorus review. Thanks for reading. 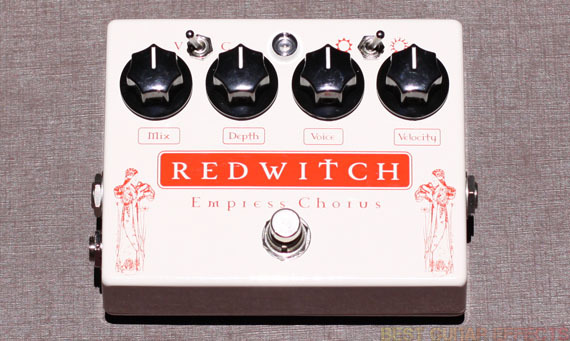 Want to buy the Red Witch Empress Chorus? I want to try of these. I’d like though that the LFO wave was more sine like (in vibrato mode at least), les square wave-ish. It’s not the first unit to feature delay time control. Maxon CS-550 is an example. Andy Summers used this on the Police reunion tour, if not still currently. A pretty high recommendation. couldn’t agree more! best chorus ever. I use it even on vocals in studio!